Spectacular design and breathtaking dynamics, combined with the allure of open-top driving - Audi presents the second generation of the R8 Spyder. Its 540-hp V10 engine provides breathtaking performance and a sound that will move you. 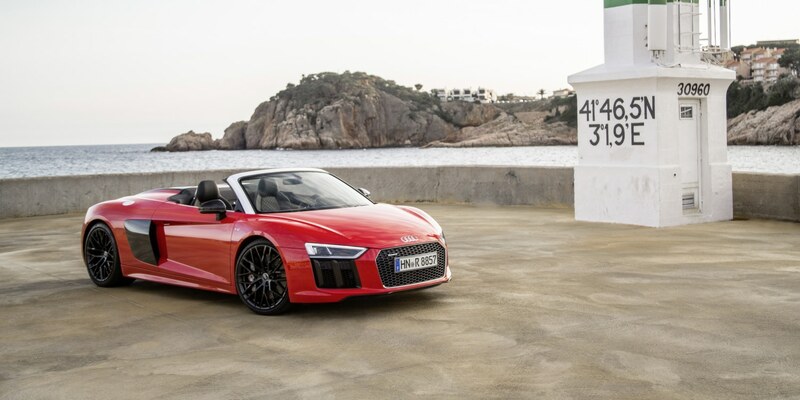 The new Audi R8 Spyder is much more chiseled and athletic than its predecessor. It has grown by 36 millimeters (1.4 in) in width to 1.94 meters (6.4 ft). This added width is underscored by the horizontal lines at the front and rear. The sculpted Singleframe with its eye-catching honeycomb grille appears wider and is positioned lower. It is flanked by large air inlets with vertical bars. Positioned seamlessly above the Singleframe are the wedge-shaped LED headlights, which are optionally available with Audi laser light. This option provides for optimal visibility in the dark and can be identified by the lighted, anodized blue strips dividing the headlights and also by the dynamic turn signals. The narrow LED lights provide a distinctive red light signature at the stately rear of the car. Downforce is provided by a large diffuser bordered on both sides by trapezoidal exhaust tailpipes. The new sideblades emphasize the sporty lines on the flanks. The inlets there feed air to the mid-mounted V10 engine. The convertible top of the R8 Spyder weighs just 44 kilograms (97.0 lb), thus contributing to the low center of gravity of the open-top, high-performance sports car. Two fins running to the rear stretch the cloth. They and the large cover of the compartment for the convertible top harmonize perfectly with the striking design of the R8 Spyder. An electro-hydraulic drive opens and closes the top in just 20 seconds at speeds up to 50 km/h (31.1 mph). The rear window is sunk into the bulkhead and can be retracted and extended electrically. With all windows up, the air stream strokes the R8 Spyder with a minimum of turbulence. The open-top two-seater has an unladen weight of 1,720 kilograms (3,792.0 lb). When weighed without operating fluids as is the norm in motorsport, it tips the scales at just 1,612 kilograms (3,553.9 lb). Its strong backbone is the newly developed multimaterial Audi Space Frame (ASF), made from aluminum and carbon fiber. The aluminum components make up 79.6 percent of its weight. In a progression from the R8 Coupé, they create a lattice that Audi’s engineers have used to incorporate specific reinforcements especially into the sills, A-posts and windshield frame. Besides the choice of materials, innovative manufacturing methods reduce the weight of individual components by as much as 10 percent. As a result, the highly rigid body weighs just 208 kilograms (458.6 lb), and its torsional rigidity has increased by over 50 percent compared with the previous model. That is the key parameter for a dynamic, solid and premium driving experience.Strong motorsport DNA: the V10 power unit. The impressive mid-engine with dual injection system sets the tone in the new Audi R8 Spyder V10. The free-breathing, 5.2-liter engine responds spontaneously and revs up quickly. Its sonorous sound – which can be optionally amplified by a sport exhaust system with gloss black tailpipe trims - is goosebump-inducing. 397 kW (540 hp) of power at 7,800 rpm and 540 Nm (398.3 lb-ft) of torque at 6,500 rpm deliver impressive road performance: from 0 to 100 km/h (62.1 mph) in 3.6 seconds and a top speed of 318 km/h (197.6 mph). The new R8 Spyder thus tops its predecessor by 15 hp, 0.2 seconds in the sprint and 7 km/h (4.3 mph) in top speed. At the same time, a variety of efficiency technologies reduce fuel consumption by ten percent versus the previous model. These include the new freewheeling mode, in which the R8 Spyder coasts when the engine is disengaged, and the cylinder on demand (COD) system, which deactivates one cylinder bank entirely at low to intermediate load. When the car comes to a stop, a start-stop system deactivates the V10 engine. Thanks to these technologies, the new R8 Spyder consumes just 11.7 liters per 100 kilometers (20.1 US mpg), corresponding to 277 grams CO2 per kilometer (445.8 g/mile). Working behind the V10 there is a seven-speed S tronic with lighting-fast action, which the driver controls electrically - by wire. The dual-clutch transmission directs forces to a newly designed quattro drive system with an electro-hydraulically actuated multi-plate clutch at the front axle. In contrast to the previous component, the all-wheel drive clutch, which is water-cooled for maximum performance, distributes the drive torque completely variably depending on the driving situation. In extreme cases, as much as 100 percent is directed to one axle. A mechanical locking differential on the rear axle provides for outstanding traction and even more dynamic handling. The intelligent control system for the quattro drive is incorporated into the Audi drive select system, which offers four modes ranging from overtly dynamic to comfort-oriented. In conjunction with the new, optional R8 performance leather steering wheel, there are three more driving programs: dry, wet and snow. They adapt the handling even more precisely to the respective road conditions. No matter how fast the car is moving through the corners, the low R8 sport seats with integrated head restraints hold the driver and passenger securely in position. Optionally available are R8 bucket seats, which are even more strongly contoured for even greater lateral hold. The standard R8 sport leather steering wheel serves as the control center, with two large satellite buttons in addition to the multifunction buttons for telephone, navigation, media and the voice control system. The driver can use these to start and stop the engine and adjust the settings of the driving dynamics system Audi drive select. The optional R8 performance leather steering wheel includes two additional buttons and a rotary wheel for controlling the performance mode and the exhaust flaps. The large 12.3-inch, fully digital Audi virtual cockpit presents all information using rich 3D graphics - if desired, in a special performance view. It brings the tachometer into the center and supplies information on the power output and torque of the 5.2 FSI engine, g-forces, lap time and the temperature of the tires, engine and transmission fluid. The R8 Spyder comes standard with the comprehensive MMI navigation plus including MMI touch. The required information can be found quickly thanks to the free text search, which makes search suggestions after input of just the first few letters. The natural voice control system understands many terms of everyday speech, which makes using the MMI system even more convenient. Standard seatbelt microphones provide for optimal audio quality, even when the top is down. Furthermore, MMI navigation plus includes a WiFi hotspot so that passengers can go online with their smartphone, tablet or other device. New onboard the R8 Spyder is the Audi smartphone interface. It displays selected content from the smartphone directly in the Audi virtual cockpit. Examples include apps for telephony, navigation and streaming services. The driver operates them via the multifunction steering wheel, the voice control system and the rotary pushbutton on the center console. Audi phone box can also be supplied. It connects cellular phones to the car’s antenna and charges them wirelessly according to the Qi standard. Audi connect gets the R8 Spyder on the Internet via LTE and makes a number of services available, from navigation with Google Earth and Google Street View to travel and traffic information to POI search. The Bang & Olufsen Sound System is another highlight: For the first time, Audi integrates two head restraint loudspeakers into each seat, for an excellent audio experience even when driving with the top down. Over and above the extensive standard equipment, customers have almost unlimited scope to tailor both the interior and exterior as they desire. There are many upholsteries, trim panels and colors from which to choose. The door sill trims can be personalized with logos and emblems. If desired, Audi will visually highlight individual add-on body components such as the new sideblades in high-gloss carbon fiber, for example. The workmanship of the new R8 Spyder satisfies the most demanding quality requirements. At the “Audi Böllinger Höfe” near Neckarsulm, roughly 500 highly qualified employees build each car with painstaking craftsmanship. Prior to delivery, each high-performance sports car undergoes a stringent procedure that begins with quality control in the factory and includes laps on the factory’s own test track and a final acceptance test drive on public roads. Presales began in July 2016 with a starting price of 179,000 euros. Initial deliveries of the Audi R8 Spyder will begin this fall. What’s good for wins in motorsport is just fine for production. Audi subjects its technologies to the ultimate acid test under live racing conditions before R8 drivers get to experience them on the road. Like the Coupé, the new Spyder shares a foundation with the R8 LMS GT3 racing car. The result is a significant performance increase over the first generation. The success of this philosophy is confirmed by prestigious awards such as the “Golden Steering Wheel” and the “Auto Trophy” bestowed on the Coupé last year.